When it comes to hoodie design we believe that each schools requirements are different. 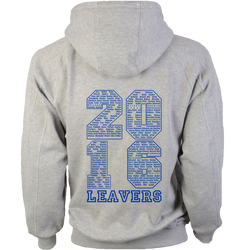 One of the main considerations when designing a leavers hoodies is the number of names to be shown. With this example there were three tutor groups with 15 pupils in each giving a total of 45 names. It was felt that 45 names were too few to display in the numbering. So the list design was chosen. We offer a great selection hoodie styles from a basic single colour hoodies to a modern base ball style jacket. We are also able to offer and extensive range of colourways and are more than happy to offer more than one colour choice. We provide samples for a sizing guides. One the name s of been supplied and the design style chosen we provide a proof design which is check and approved before we go to print. NextGen handle the whole process.​. For a great finishing touch NextGen will embroider you school's logo on the front of the garment if you require. We can also add initials on the front of the garment or names down the sleeve.